Although Worldflight has been in operation since 2000 a Perth based sim only joined the event in 2013 flying Flightcity Simulation Centre’s Boeing 777 with a team of 13 pilots. 2014 saw a slightly different crew flying Velocity738, a Boeing 737NG simulator owned and built by Gwyn Perrett of Aerosim Solutions in Perth. 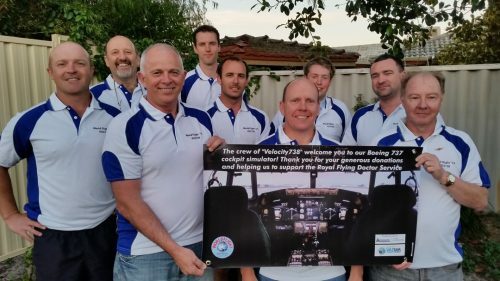 Then in 2015 Greg Hateley came on board with his 747-400 simulator joining the Perth contingent with a separate crew all raising funds for the Royal Flying Doctor Service Western Operations. Worldflight crews use real world procedures and flight plans to achieve as close to real world aviation operations as possible. Our crew come from a diverse range of backgrounds, some are real world pilots both commercial and private, others work in the airline/aircraft industry while others are simply flightsim enthusiasts. One thing is common however and that is a love of aviation and all things aircraft related. Visit our Facebook page for up to date details or just to have a chat!